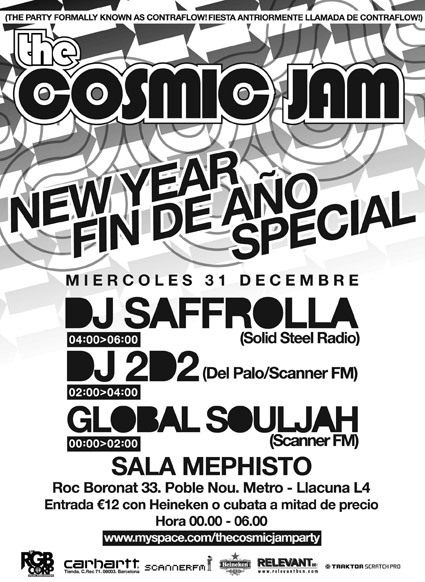 You can celebrate your first dance in 2009 with Global Souljah, Barcelonas man for a unique blend of soulful jazzy classics with global grooves and brand new beats. Thats what also DJ 2D2 likes, his soulmate from Radio Scanner FM. After his mulitdimensional set between Hip Hop, Reggae and Funk DJ Saffrolla from Ninja Tune will take over. His DJ set offers a shacking mix through the genres and bpms – sprinkling and mixing in Hip Hop, Breakbeat, Drum and Bass and a general assorted mish-mash of beats. A truthfully infinite cosmic jam that guarantees an inimitable New Years Day.